The General Election result was a great disappointment. Right up to the moment that last ballot paper was dropped in a ballot box, I thought Labour had done enough to stop the Conservatives forming another government – even a coalition one. I believed the opinion polls – as most people did – and it was heartbreaking to see David Cameron outside Number 10 on Friday 8 May. I suppose it was inevitable that Ed Miliband would stand down as leader. Had he managed to stop the Tories forming a government he probably would have stayed but the result was a humiliation for him. This has led to the major framework for discussion about Labour’s future becoming one about which personality should take the helm: Andy Burnham, Yvette Cooper, Liz Kendall or Mary Creagh. I have not been impressed with the level of discussion from the candidates as it has mostly been soundbites about ‘aspiration’, ‘middle England’ and ‘moving out of our comfort zone’. It’s clear to me that we need a proper debate about how the party can improve not just with a leader figure – or with soundbites – but with policies and how we campaign. 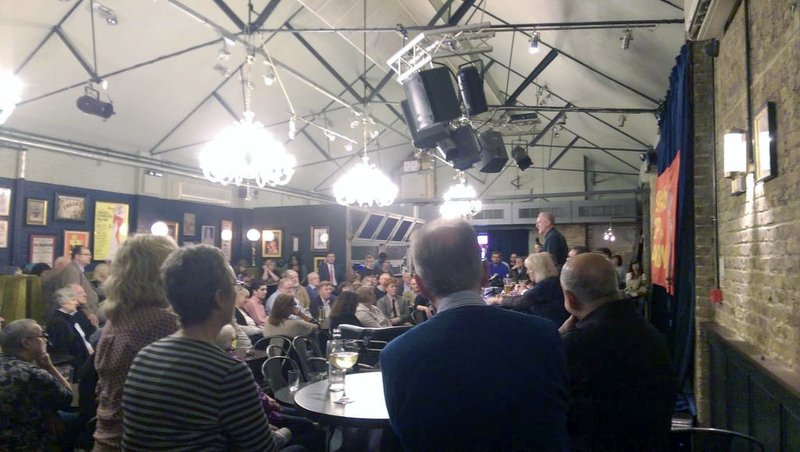 That’s why I organised a public discussion in Chiswick on Sunday, ‘What Next for Labour?’. I wanted to open up the discussion about Labour’s future and to give people an opportunity to air their frustrations and ideas. 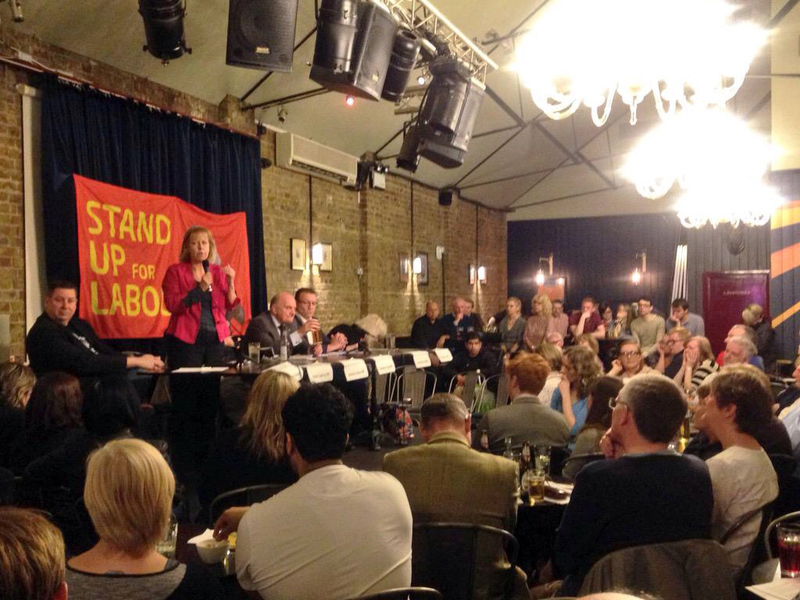 I invited six people from across the party and Labour movement to appear as a panel: Stephen Cowan (Leader of Hammersmith and Fulham Council); Ruth Cadbury MP; Jeremy Corbyn MP; Stephen Pound MP; Gary Doolan (GMB National Political Development Officer); and Ann Black (NEC representative). In order to cover the cost of the venue hire and the social event afterwards, I charged £5 a ticket and over 150 people turned up. Although the meeting started late owing to late arrivals, the panel managed to cover a lot of ground. 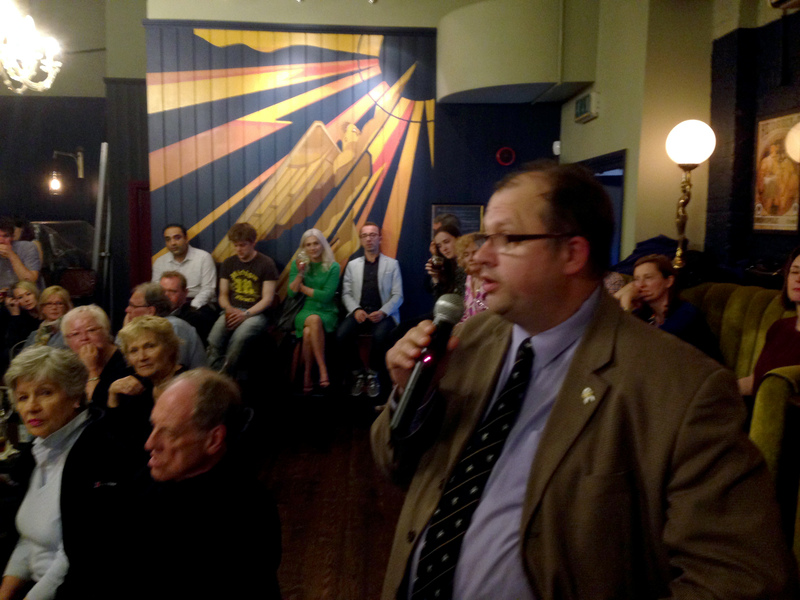 Stephen Cowan described how Labour had won Hammersmith & Fulham council with ‘an appeal to the decency of people’. Local issues such as the threatened closure of Charing Cross Hospital and the planned closure of a good primary school to be replaced by a free school gave Labour a moral authority that appealed to many people. These community organised campaigns ‘didn’t mind who people had previously voted for’ so were not just looking to identify traditional Labour support. Stephen said that he drew up a list of what voters might see as a positive and negative to voting Labour and worked at taking away any of the negatives (an example of this was that the previous Conservative-run council had cut council tax for eight years, so Labour pledged to continue this). This meant the Labour led the agenda. The campaign also involved improving organisation locally through setting up a campaign academy that led to dozens of excellent candidates being selected. The result of all this was a borough-wide landslide to Labour (for example, a 15.1% swing in a ward where ‘Made in Chelsea’ is filmed). Ruth Cadbury said that although Labour won back Brentford & Isleworth, the margin was much smaller than expected. It was felt that the constituency should never have been lost in 2010 so the low majority was a concern. It was clear to Ruth that she had won many votes from ‘small l’ liberals who didn’t want a Conservative MP, but that there were many people who needed to be convinced about Labour’s policies and record on the economy. There were several occasions where she would hear people following the Conservative line about Labour being the cause of the economic crash and this idea seemed to stick. There was also a lack of clarity in Labour’s vision and concerns about the SNP’s power in a possible coalition were also a factor in Labour losing votes. Ruth ended by saying that whoever the new Labour leader is, they must work with people from all sides of the party and that we must invest in campaigning. Jeremy Corbyn spoke about the ‘weird and contradictory’ election result where there was no uniform swing nationally or, even, regionally. There was a ‘whiff’ of 1992 about it, with the Conservatives tapping into people’s fears about tax and benefit-claiming immigrants (an issue that Jeremy says ‘we walked into’). There was a problem of ‘conflicting messages on austerity’, with Ed Miliband making pledges that seemed to be refuted by treasury spokesman committed to cuts. Not enough young people voted (only 43%) and also not enough of the very poorest people. In a rallying cry, Jeremy called for Labour to be more ‘visionary’: to ‘mobilise, enthuse and inspire’ people and said he would be out on the anti-austerity march on 20 June. Stephen Pound talked up the positive results in west London but also pointed to the fact the Government has already closed the maternity unit in Ealing. Despite robust campaigning across Harrow East, the BME vote had ‘turned against us’ and Labour should not take these votes for granted. There were some mistakes in the campaign: the narrative was confused; the ‘limestone block’; and the commitment to limit rent increases was too late too. Stephen did not think we should naval gaze, however. For him, the key was to ‘organise’ and to fight the Conservatives at every turn. Stephen’s speech showed the spirit of the meeting and of the room. There may have been differences in opinion but there was a real sense of unity of purpose. Gary Doolan said the whole party failed and there was no point in laying blame: not enough union members got out to vote, there was no discipline in some areas in the party and we failed to challenge the cuts and the myth that Labour had created the collapse of the financial system. The people who will pay for this are the people who go to foodbanks, people who rely on the NHS and those working in public services. Like Stephen, Gary was keen to show that Labour must start to organise and get people to come out campaigning so that the necessary 40-50 seats can be picked up at the election in 2020. The leader should be someone we can all work with and where there is ‘discipline installed within the party’. Ann Black said that as NEC representative for members she had received hundreds of emails from members with their opinions on what had gone wrong in the General Election. She was unsure how to read the Scottish result and asked whether the ‘ground war’ had been as successful as had been hoped. With many results for target seats not reflecting a higher share of the vote than neighbouring, non-target seats, Ann wondered if the work put in by organisers was to no avail (Milton Keynes and Reading were two such examples). ‘Promises’ of votes to Labour also did not materialise, and Ann wondered if perhaps the personalised mail sent out by the Conservatives in the last week of the campaign made a bigger impression. Ann believed the Tory narrative about the economy being accepted by so many people was a major contributory factor in losing the election. She said we must not let this happen again. She said there is no common explanation for what went wrong in the election or where the party should go with policies, so it would be best to have as many leadership candidates as possible on the ballot paper, holding hustings and bringing debate out that way. Following the speeches from the panellists there were a number of questions and points raised by the audience. A recurring theme was the failure of Labour to rebut the Tory and Tory media claim that Labour had been irresponsible with the economy and had caused the deficit. There were calls for the Labour Party to have its own media to combat bias. The issue of Land Value Tax was raised as a possible policy. Audience members and panellists agreed that the union link is vitally important to the Labour Party. It was felt that Labour could do more to promote its own ideas through having its own media outlet, such as with a television channel. Following the discussion, food was served and there was a Stand up for Labour social event after that featuring three of the best comedians on the circuit. There was a lot of frustration about the way we lost the General Election but this did not lead to bickering or finger pointing. It’s clear to me that the best way for Labour to move forward is to have open discussions of this type, which bring people together. It was wonderful to see so many people from different sides of the party talking constructively about lessons we can learn from the campaign and how we can improve. It will be really unhelpful to have factions within the party pushing their own agenda behind closed doors. There were several new members of the party there on the night and two people actually signed up online during the evening. This is something that gives me great hope.